PBHA Shortlisted for Natwest Skills and Opportunities Fund! Great News! 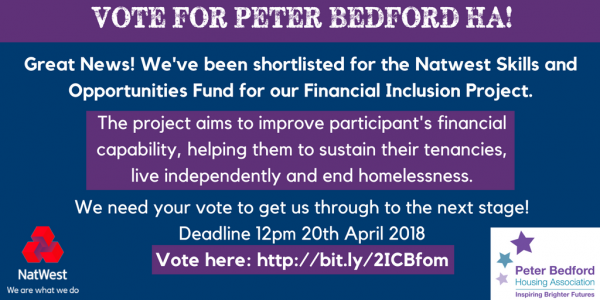 We have been shortlisted for the Natwest Skills and Opportunities Fund for our Finacial Inclusion Project with Evolve Housing. The project aims to improve participants financial capability, helping them to sustain their tenancies, live independently and end homelessness. We need your vote to get us through to the next stage!